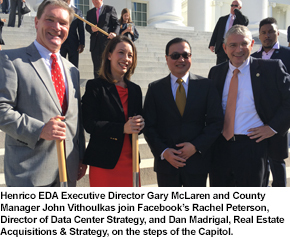 BREAKING NEWS: Virginia Governor Terry McAuliffe and representatives from Facebook announced today that the social media giant will invest $1 billion in a new data center complex in eastern Henrico County. 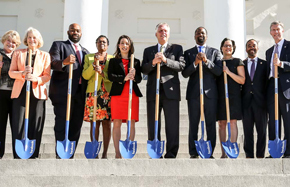 The facility is to be built on a 328-acre site near Technology Boulevard and Portugee Road in White Oak Technology Park and is expected to bring as many as 240 jobs to the county when completed. The news was shared on the South Portico of the State Capitol with the press, state and local lawmakers. 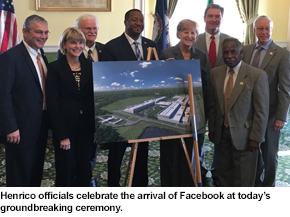 The Henrico Facebook data center will be constructed in phases, with the first phase of the build to be a nearly one million-square-foot data center equipped to accommodate 100 employees and contractors. Three other buildings will follow, totaling 1.5 million square feet of space planned for the site and bringing the overall square footage of the complex to 2.5 million. Construction costs are expected to total $750 million, with another $250 million going toward building solar generation facilities that will allow the data center to be up to 100 percent powered by renewable energy.